With the growing issue of charging infrastructure, this weird drone solution sounds promising. Imagine you are driving in an electric vehicle (EV), and you notice that you’re running low on charge. You use your smartphone — not to find a charging station, which you hope is within range, but to summon a charging drone — and you keep driving. Within minutes, a drone is hovering over your car, and your battery is charging. You never even had to leave the road. This could be in our future if one new patent leads to a prototype and eventually a product. It is one response to the practical problem posed by the anticipated proliferation of EVs: charging infrastructure. Back in April, Tesla announced plans to double the size of its charging infrastructure in 2017, both in urban centers and along highways. These plans will bring Tesla’s total to more than 10,000 Superchargers and 15,000 Destination Chargers in service all over the globe. Now, while these massive expansion plans aren’t yet enough to keep up, Tesla isn’t the only entity focusing on charging points. As of 2016, these points were more plentiful in Japan than traditional fossil fuel filling stations. Proterra has developed a rapid charging system for electric transit, but it relies on the existence of charging infrastructure. Honda has designed a dynamic charging system that would recharge while the vehicle was in motion—but again, the problem is infrastructure. 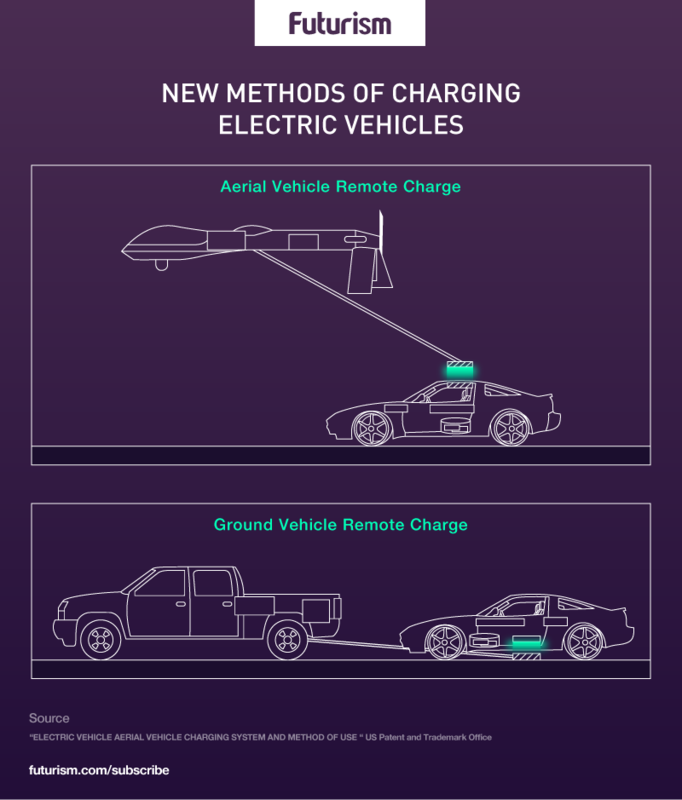 While this innovative drone charging system would be revolutionary for EVs, the mere filing of a patent application does not guarantee that an invention will ever be made. In the meantime, it seems that all of the minds working on Evs need to advance solutions to solving the problem of infrastructure expansion.